In this photo made available by Madonna's publicist, Liz Rosenberg, Madonna holds her adopted son David as they meet with the boy's biological father, Yohane Banda, left, at a lodge where the pop star is staying in Lilongwe, Malawi, Monday 30 March 30 2009. The pictures were taken by Tom Munro - the photographer/director behind the Elle portfolio and the Give It 2 Me video. Madonna has confirmed her attempts to adopt a young Malawian girl and said through a spokeswoman that she is following standard procedures in adopting the child amid criticism by some that she was using her fame to quicken the process. The 50-year-old pop superstar also confirmed she took her 3-year-old son David, also adopted from Malawi, to visit with his biological father Yohane Banda for the first time since she and David left the country in 2006. 'Madonna is committed to maintaining an ongoing relationship with David's Malawian roots,' said Liz Rosenberg in a statement Tuesday morning. Madonna arrived in the African nation this week with David, her 12-year-old daughter Lourdes and 8-year-old son Rocco, and has toured the country and also visited a day care center built by her charity. But she also came to the country in attempts to bring home another child from Malawi. In her statement, Madonna confirmed she is trying to adopt a girl named Chifundo 'Mercy' James who is about 4 years old. Malawian welfare official and another person involved in the proceedings had confirmed an adoption application was under way and spoke on condition of anonymity because the case is considered sensitive. German Magazines: Bunte, Gala and OK! Here are scans from the recent editions of German magazines Bunte (26 March issue), Gala (26 March issue) and OK! (26 March issue) which feature articles about Madonna's night out with Gwyneth Paltrow. Madonna must return to court in Malawi on Friday to learn if she can adopt a second child from the African country. The singer attended an hour-long hearing in Lilongwe to ask for permission to take 4-year-old Chifundo James out of the country. Chifundo has been living in an orphanage since her 18-year-old mother died, shortly after giving birth. Madonna has said it is 'amazing' to be back in the country where she adopted David Banda in 2006. The girl at the centre of the case, whose name translates into English as Mercy, is in the same orphanage that was home to David, who is now three years old. Madonna entered the court of Judge Esme Chombo through a back door without answering questions from the media. The case was heard in private but afterwards a lawyer for the singer confirmed Madonna was seeking an 18 month interim adoption order. Madonna is in the country with David Banda and her two biological children, Lourdes and Rocco. She is applying to adopt Mercy as a single parent. UK newspapers the Daily Mirror and Metro both featured Madonna on their front covers and published pictures of her arrival in Malawi yesterday. US pop star Madonna arrived in impoverished Malawi Sunday, airport officials said, to file documents allowing her to adopt a second Malawian child, this time a three-year-old girl. A private jet carrying the pop star and her entourage landed at Lilongwe's Kamuzu international airport shortly before 2:00 pm (1200 GMT). The plane landed on a runway reserved for cargo planes, far from waiting journalists and photographers. The singer left the airport in a convoy of four vehicles. Madonna is due in court on Tuesday to file adoption papers for three-year-old Mercy James from an orphanage in southern Malawi, according to a court official. The singer had spotted her during her first visit to Malawi, in 2006. UK magazine Hello! (31 March issue 1065) published a two-page spread about Madonna and Gwyneth's night out in New York City earlier this month to celebrate the launch of the documentary Valentino: The Last Emperor. Madonna is 'glad' she divorced Guy Ritchie. The 50-year-old singer spent 10 minutes online chatting to members of her fan club to thank them for their support and get feedback on their favourite songs for her forthcoming greatest hits album. 'Sitting here with Madonna. Firstly, she wants to say hello to all the fan club members out there,' wrote Oseary. Before she signed off, Madonna accused gossip blogger Perez Hilton of preferring Britney Spears because he made a special video clip for her to play during her current Circus tour. 'You obviously love Britney more cause you made an opening film for her show and not mine. I still love you, - going to sleep! - M,'(sic) Madonna joked. A new video clip of Madonna introducing her documentary I Am Because We Are is now available to view online. I Am Because We Are will be featured on Hulu.com from Thursday 26 March. The remarkable documentary film by director Nathan Rissman and Raising Malawi co-founder Madonna, documents the extraordinary challenges faced by Malawian children in the wake of the AIDS pandemic. While the film features appearances by Madonna, Archbishop Desmond Tutu and President Bill Clinton, its real stars are the spirited children whose stories so heart wrenchingly relate the complexities of life in the developing world. I Am Because We Are has inspired audiences at film festivals worldwide with its message of interdependence and intrinsic connection between all peoples. Its title is derived from a concept in African spirituality which states that the very existence of any one of us is defined by the well-being of others. 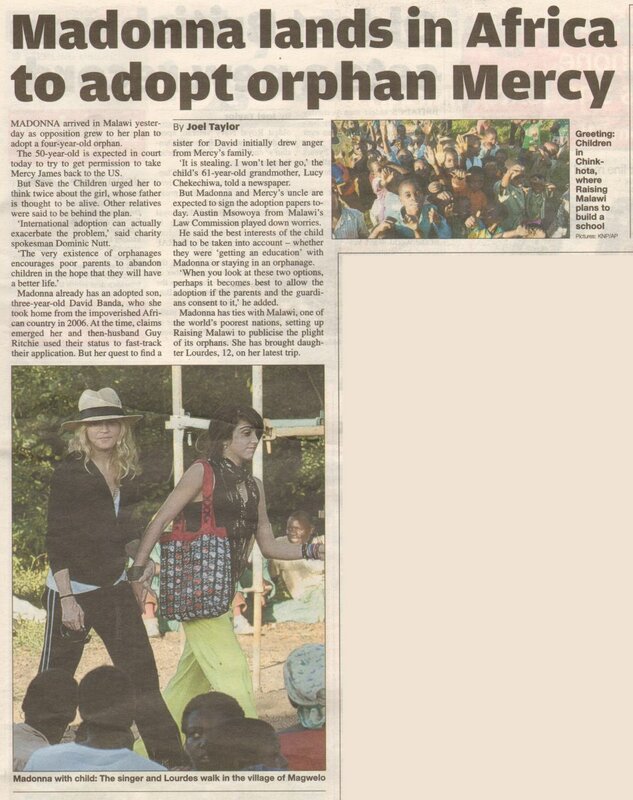 The news that Madonna will file papers to adopt a second child from Malawi made the front page of UK newspaper the Metro. Pop star Madonna is to travel to Malawi in a bid to adopt a second child, government officials from the African country have told the BBC. The 50-year-old is expected to arrive at the weekend and attend a procedural hearing at the High Court on Monday. She recently told Malawian newspaper Nation that she had been considering another adoption, but wanted the support of the authorities. Madonna's official adoption of David Banda was confirmed last year. An official at the Malawian department of women and child welfare told the BBC's Raphael Tenthani that the pop star had already filed adoption papers and her case could be heard as early as next week. Madonna's spokeswoman in New York, Liz Rosenberg, would not comment. Critics accused the Malawian government of sidestepping laws banning foreign adoptions in order to allow the celebrity to take David home with her. After the adoption was legalised, Madonna said the difficulties had arisen because 'this adoption essentially was the beginning of the creation of adoption laws in Malawi'. The current edition of UK magazine heat (28 March - 03 April issue) also featured a look at Madonna and Gwyneth's night out in the Big Apple last week. The magazine also picks up on the fact that Madonna is looking very Kate Winslet-ish....and that Anne Hathaway looks rather bored in the background! UK newspaper the Metro published this story about Madonna and Gwyneth's party night out at The Plaza's Oak Room on Tuesday 17 March. The April 2009 issue of UK magazine Record Collector features this one-page article about a 'lost' Madonna tape recording of her earliest solo work from 1979. The latest editions of UK celebrity magazines heat (21-27 March issue) features Madonna's schoolgirl fancy dress for Purim in New York City. Britney Spears has put an end to the suggestion that she is going to perform alongside Madonna on her Circus Tour. Rumours were spread by newspapers after an admission from an alleged Britney stylist and developed when Madonna was spotted at Britney’s New York show last week. David Alexander was cited as saying that Madonna was set to join the 'If You Seek Amy' singer on stage. The statement continued 'David Alexander is not Britney's stylist nor have we ever heard of him.' So it looks like it’ll just be Brit when she hits European shores this summer. The latest editions of UK fashion magazines Grazia and Look (23 March issues) both feature Madonna's fancy dress outfit for the Purim Festival at the New York City Kabbalah Center earlier this month. 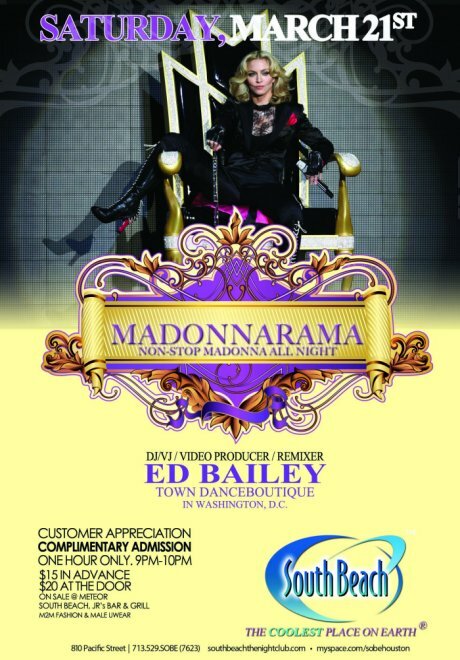 Calling all Madonna fans! The Queen of Pop is coming out with a long-awaited greatest hits collection this fall. Still, the new album won't only feature songs her fans know and love. 'Madonna does have plans to go into the studio to record a few new songs for this album,' says Rosenberg. The greatest hits album will be Madonna's last with Warner Records, with whom she sold more than 200 million albums. In October 2007, she ended her 27-year relationship with the label when she signed a reported $150 million deal with concert promoter Live Nation. UK magazine Hello! 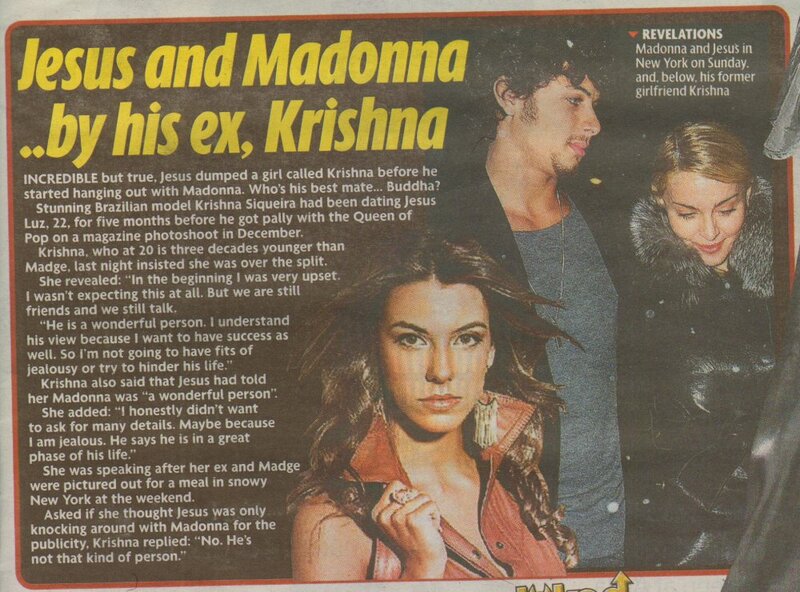 (17 March issue 1063) devoted three pages to Madonna's rumoured romance with Brazilian model Jesus Luz - click on the article to enlarge. Canadian and US cable/satellite television station FUSE has a half hour Madonna special entitled The Madonna Chronicles: Rock and Roll Hall of Fame Special Edition scheduled to broadcast this week on Wednesday 18 March at 9:30pm (EST). Pop star Madonna has said she may adopt another child from the poor southern African country of Malawi despite the controversy surrounding an earlier adoption. Critics accused the government of skirting laws that ban non-residents from adopting children in Malawi, which has been badly hit by the AIDS epidemic, after Madonna took on David Banda. 'Many people - especially our Malawian friends - say that David should have a Malawian brother or sister,' she said in response to emailed questions from Malawi's the Nation newspaper. A Malawian court approved the adoption of David last year. Madonna has said the controversy had been difficult to deal with but she was happy to be involved in a case that might pave the way for more adoptions in Malawi. An estimated one million children in the country have been orphaned by AIDS. David is growing up in the high-flying life of a leading popstar, worlds away from his village of Lipunga, where Banda's relatives eat staple food like maize meal from simple bowls and meals are cooked on open fires. Madonna said she wanted to keep him connected to his homeland. 'It is a big priority for me to educate my son about the world, but always to stay connected to his Malawian culture,' she said. Madonna said her divorce from film director Guy Ritchie would not deprive their children of either parent. 'I believe in family. So, everything between us is very amicable....we both agree that our children should always feel a deep connection with both their parents. It is our responsibility to give them that foundation,' she said. UK newspaper the Sunday Mirror published this interview with trainer Tracy Anderson in it's supplement magazine yesterday. Tracy speaks about her two celebrity clients, Madonna and Gwyneth Paltrow, and how Madonna is the good girl when it comes to training! madonnalicious has uploaded some more pictures into the galleries and you can view the latest upload of 160 pictures here. Four rare pictures taken by Richard Corman of Madonna during the early part of her career are being made available as limited-edition prints all signed and numbered by the photographer himself. Fans can find out more about these prints at the boy culture blog. Cyndi Lauper has defended fellow pop star Madonna's rumoured relationship with a man 28 years her junior. The Material Girl, 50, has been widely criticised in the press for her alleged romance with 22-year-old Brazilian model Jesus Luz. But Lauper insists its unfair to judge Madonna for having a younger boyfriend, pointing out that it isn't unusual for a male star to step out with a woman half his age. The Blame It on Rio March issue of W magazine finally made it into the UK late this week. The edition proved so popular that all copies were sold out in one day from the Oxford Street branch of Borders and many local London newsagents sold out too. Selfridges on Oxford Street still had about 15 copies at the end of Friday, and a few copies were still available at larger WHSmiths. Madonna made a surprise appearance at Britney Spears' sold-out Circus show Wednesday in New York City. Shortly before Spears, 27, took the stage at the Nassau Coliseum on Long Island, Madonna, 50, arrived with her manager Guy Oseary (and several bodyguards) and headed to one of the VIP suites. During the 90-minute show, Spears gyrated her way through mostly tunes from her last two albums, Circus and Blackout. As hordes of screaming fans gathered around her, Madonna had a little smirk on her face. 'Britney was thrilled to have her there!' read a message on Spears' Web site. The Sticky & Sweet Tour will visit St. Petersburg Palace Square on Sunday 02 August at the Palace Square. A dedicated fanclub presale will begin on Thursday 12 March - check out the tickets page at www.madonna.com for sale times. The general public sale will start at 10:00am (Local Time) on Monday 16 March. 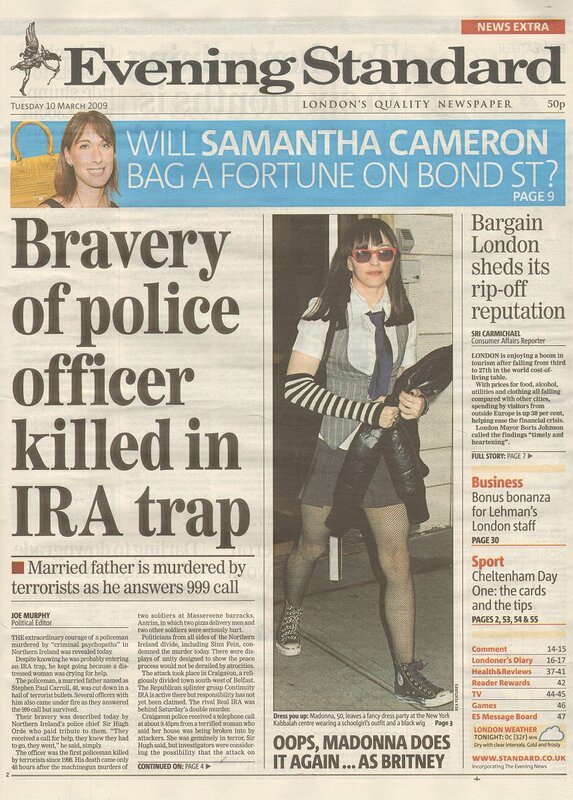 Madonna's fancy dress for the Purim Festival in New York City was featured in several UK newspapers today - and all mentioned that Madonna seemed to have raided Lourdes wardrobe for her costume! Below are scans from the Daily Mail, Daily Mirror, Daily Star and the Metro. Madonna spent yesterday evening celebrating the Jewish festival of Purim at the Kabbalah Center in New York City. This time Madonna raided Lourdes' wardrobe and dressed up as a 'naughty schoolgirl', her current squeeze Jesus Luz, dressed as The Joker. UK newspaper the Evening Standard featured Madonna on the front cover and a small article inside talking about the custody hearing taking place in court tomorrow. Madonna has applied to close the seas around Helsinki, Finland so she can commandeer a small island to stage a gig for 80,000 people, according to reports. The Holiday hitmaker is taking her Sticky & Sweet world tour to Jatkasaari, Helsinki in August. And she has applied to officials to close the sea and airspace over the area to prevent ticketless fans from enjoying the spectacle for free, reports Britain's Daily Star Sunday. But locals are not happy with the request and are worried about the effect the concert will have within the community. 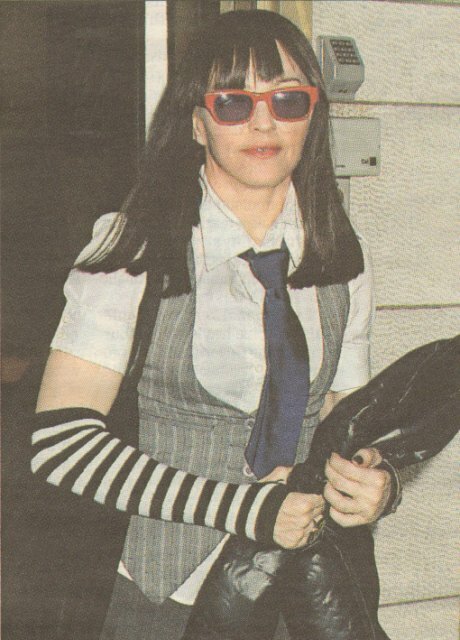 UK newspaper the Sunday Mirror featured this brand new picture of Madonna attending the Kabbalah Center in New York City on Friday (06 March) evening. Yesterday Pet Shop Boys gave media the chance to pre-listen to 'Yes', their forthcoming new record, in London, for review purposes only and, after the album listening, Neil Tennant (Pet Shop Boys frontman) held a Q&A session with reporters. One of the several questions they asked was about Pet Shop Boys latest (scrapped) collaborations and Neil shockingly stated that after remixing 'Sorry' in 2006, they were contacted again by Warner, in 2007, and asked to write & produce some tracks for an album Madonna was planning at the time (which later became 'Hard Candy'). Sadly, the same week Warner's changed their mind and according to Neil own words 'we got told to forget it as they decided to shove her down the r&b route'. These pictures from madonnalicious Freddy at the second Santiago show on Thursday 11 December complete the Santiago and Rio De Janeiro sections of the tour gallery. 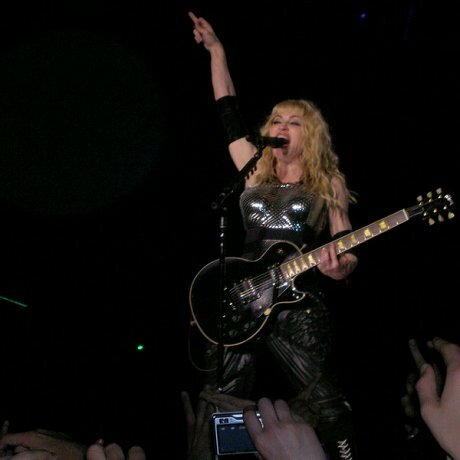 Lets go back to the South American leg of the Sticky & Sweet Tour where madonnalicious reader Freddy took these great pictures at the first Santiago show on Wednesday 10 December 2008. Christian Audigier is no stranger to the power of celebrity when it comes to marketing his clothes. And while stars including Britney Spears, Heidi Klum and Nicollette Sheridan have been snapped in pieces from his Ed Hardy fashion line, the French designer has reportedly called on the pulling power of one of the world's most iconic women, Madonna. The 50-year-old Material Girl is said to have jumped at the opportunity to work on a trendy new range for the tattoo-inspired fashion label when she was approached by Christian, who's designing an outfit for Michael Jackson's upcoming tour. Following her foray into fashion design with H&M the stylish singer has been offered six-figure deal to design a special collection that will include tattoo-inspired T-shirts and diamante-encrusted bodices, the Daily Mirror reports. The Sticky & Sweet Tour will stop at Paris Bercy on Thursday 09 July 9th. A devoted ICON fan club presale will start on Monday 09 March at 10:00am (Local Time) for Legacy members and at Noon (Local Time) for newer members. Please note that the public ticket sale will start on Thursday 12 March at 10:00am (online) and at 10:30am (classic outlets). A handful of Hollywood's rising stars got all dressed up to portray American icons over seven decades for the April issue of Glamour. Emma Roberts looks cute as a button doing her best Audrey Hepburn, while America Ferrera goes more political as Dolores Huerta. Madonna was among the winners at the 23rd edition of the Recording Industry Association of Japan (RIAJ) Gold Disc Awards at Tokyo International Forum in the Yurakucho district of Tokyo. The awards, held March 2, celebrate the artists that have sold the most in sales categories that range from singles and downloads to albums and total sales. Madonna, on the strength of her 'Hard Candy' (Warner Bros) album and digital download single 'Miles Away,' got the Japan Gold Disc award for international artist of the year. She also won the mastertone of the year award for the same track. It was, the TV voiceover promised us, not to be missed. The Material Girl was to put the fizz into Pepsi's campaign - for a fee of $5m. UK pop star Cheryl Cole is also a fan of the Stella McCartney designed charity tshirt and is pictured wearing it in the 02 March issue of Look magazine. The most fashionable range of charity t-shirts ever created has just got even cooler with this amazing, limited edition, Madonna t-shirt added to the mix! They’ve been flying off the shelves at TK Maxx, which is hardly surprising given that Stella McCartney designed the entire range in support of Red Nose Day 2009. Even the A-list stars, including Cheryl Cole and Keira Knightley, have been snapped wearing this designer number, so what are you waiting for? Get yourselves into a TK Maxx store to bag a t-shirt before they’re gone forever! The Madonna design comes as both a tshirt and a vest and although the Madonna ones have sold out online they are still available to buy in store at TK Maxx for £14.99 - with at least £8.00 of the price going to charity. Madonna's new man is not only called Jesus, he is also, whisper it, 28 years younger than her. Good for her, says Hadley Freeman. A new item has been added to the official Madonna online merchandiser Fanfire.com - a vintage Madonna tshirt is now available to pre-order at Fanfire.com now. Today UK newspapers, the Daily Mail and Daily Mirror, published the latest pictures of Madonna and Jesus in New York City on Sunday night. Madonna made more money in concert last year than anybody else, male or female. She’s a star. Once upon a time - about 25 years ago - I questioned this. I came to see the error of my skepticism. Oscar could have used a shot of Ciccone.